For any/all who constantly use the right click popup menu, I have a very powerful one I wanted to share. 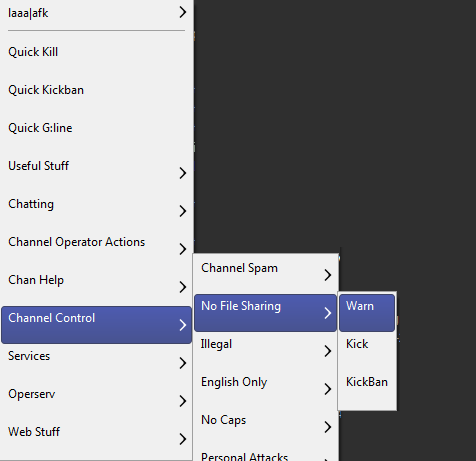 Make sure you you have done the command below for proper ban control. I originally posted this in 2008, while running a crappy dell machine, and therefore I was using all sorts of portable apps. However I still believe it useful to a lot of people, so, here you go! Easily the most powerful open source browser is also availible in portable form. You can even save your bookmarks, addons, and history right to the usb. My FTP client of choice. Runs fast and allows you to upload on the fly. Great program for watching a lot of Video and Audio formats. Instead of using Adobe’s slow and junky PDF reader, use this free one thats fast. Instant Messaging Program that works with AIM, Jabber, ICQ, IRC, MSN, Yahoo, Gadu-Gadu and more. A simple program that scans your hard drive for duplicates. Bonus: Learn how to Put Windows, Mac, and Linux on a usb stick. I am now dual-booting Vista and XP, just for the programs that run on XP and barely work on Vista. Instead of installing the programs on both Vista and XP, I’m running the programs off of my 2 gigabyte Cruzer micro usb drive. I’ve found some awesome programs that I’ve run smoothly right off the drive. Here are the top 10 recommended portable programs.